24 was an American action series that aired on Fox from November 6th, 2001 through May 24th, 2010. During its nine year run on Fox, 24 featured many well known actors including Kiefer Sutherland, Elisha Cuthbert, Dennis Haysbert, Mary Lynn Rajskub, among others.24 centers around the work of C.T.U. : Los Angeles (Counter Terrorism Unit) and the agents that work there. C.T.U. acts a division of the Department of Defense, intended to specialize in prevention of terrorist attacks and apprehension of known terrorist from around the world. Jack Bauer (Sutherland) is the main character of 24, Bauer operates out of C.T.U. : Los Angeles as a senior field agent, and temporarily as the head of C.T.U. Jack Bauer serves as an indestructible agent who never fails to save the day. Bauer, however, quickly develops a reputation within C.T.U., The Department of Defense, and The White House as an entirely untrustworthy, loose-cannon. Bauer is a man seemingly intent on pushing himself, the boundaries of morality, and often the law far beyond normal limits. During the eight seasons of 24, Jack Bauer, with the help of C.T.U., The Department of Defense, local police forces, and The White House, managed to prevent multiple assassination attempts, and many nuclear attacks. While working undercover with a group of drug dealers Bauer became heavily addicted to drugs, much to the dismay of his fellow agents, his superiors, and his daughter Kim Bauer (Cuthbert), who later becomes an agent at C.T.U. Each season of 24 told the story of one 24 hour period, with each episode running an hour long. The first six seasons took place mainly in and around Los Angeles, California, then traveled to Washington, D.C. for the seventh season, finally concluding with the eighth season which took place in New York City. Between seasons six and seven, the makers of 24 created a television movie, 24: Redemption, which took place in South Africa. Typical episodes of 24 followed key government officials including four presidents throughout the eight seasons, terrorists involved in the would-be attacks of the day, C.T.U. agents, and of course, Jack Bauer. One aspect of 24 that made it an immensely thrilling show was that all of the events took place in real-time, guaranteed to keep viewers on the edge of their seats. 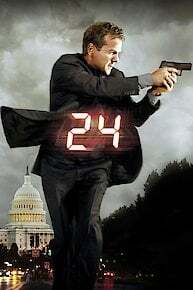 The currently airing season of 24 is titled "24: Live Another Day". Please click here to go to that page. Episode 12 - Day 9: 10:00 P.M. - 11:00 A.M. Episode 11 - Day 9: 9:00 P.M. - 10:00 P.M. Episode 10 - Day 9: 8:00 P.M. - 9:00 P.M. Episode 9 - Day 9: 7:00 P.M. - 8:00 P.M. Episode 8 - Day 9: 6:00 P.M. - 7:00 P.M. Episode 7 - Day 9: 5:00 P.M. - 6:00 P.M. Episode 6 - Day 9: 4:00 P.M. - 5:00 P.M. Episode 4 - Day 9: 2:00 P.M. - 3:00 P.M. Episode 3 - Day 9: 1:00 P.M. - 2:00 P.M. Episode 2 - Day 9: 12:00 P.M. - 1:00 P.M. Episode 1 - Day 9: 11:00 A.M. - 12:00 P.M. Episode 24 - Day 8: 3:00 P.M. - 4:00 P.M. In the 24 series finale and last episode, President Taylor puts all her concentration into the signing of the peace treaty; and Jack has to once again take matters into his own hands. Episode 23 - Day 8: 2:00 P.M. - 3:00 P.M. In the series finale, President Taylor puts all her concentration into the signing of the peace treaty; and Jack has to once again take matters into his own hands. Episode 22 - Day 8: 1:00P.M. - 2:00P.M. Episode 21 - Day 8: 12:00P.M. - 1:00P.M. Determined to discover who is behind the day's devastating events, Jack uncovers an unexpected lead. Episode 20 - Day 8: 11:00 A.M. - 12:00 P.M. Episode 19 - Day 8: 10:00A.M. - 11:00A.M. With only six hours left, the clock races toward the series finale as President Allison Taylor faces impossible choices and much to the dismay of CTU, she enlists a private security firm to complete a sensitive task led by Mark Bledsoe. Meanwhile, Jack calls in a favor to his old friend Rick Vickers before he embarks upon a crucial mission of his own. Episode 18 - Day 8: 9:00A.M. - 10:00A.M. With only seven hours left in the series' final harrowing day, Jack Bauer sets out to avenge the tragic life-changing events that he has endured. As things become even more personal for Jack, he heads to CTU for an intense meeting after learning of a devastating development. Episode 17 - Day 8: 8:00A.M. - 9:00A.M. As the country reels from the day's devastating events, stalwart President Taylor attempts to resuscitate the peace agreement, the cornerstone of her administration. Much to her dismay, she is forced to solicit the services of disgraced former President Logan. Meanwhile, Jack Bauer makes an unprecedented emotional move that triggers the unthinkable, and back at CTU, Chloe is charged with new responsibilities. Episode 16 - Day 8: 7:00 A.M. - 8:00 A.M. Episode 15 - Day 8: 6:00 A.M. - 7:00 A.M. Episode 14 - Day 8: 5:00A.M. - 6:00A.M. As the threat of mass destruction clarifies, President Taylor tasks Jack with a crucial mission. Episode 13 - Day 8: 4:00A.M. - 5:00A.M. CTU is paralyzed and their only weapon left is Jack Bauer. Episode 12 - Day 8: 3:00A.M. - 4:00A.M. While Jack and Cole team up in the field to shield New York from the calamitous threat, a hostage situation has CTU completely stressed out. Meanwhile, unrelenting parole officer Prady presses on in his investigation, and unexpected developments send the Hassan family into a major tailspin. Episode 11 - Day 8: 2:00A.M. - 3:00A.M. Jack prepares to go to Farhad Hassan's last known location to rescue him and stop an impending terrorist attack on New York City. His other endgame is to clear Renee from taking the fall if the operation fails.President Taylor warns President Omar Hassan that if the attack is successful, she will have no choice but to declare war on his country.Cole and Dana have to figure out how to solve the aftermath of the confrontation with Kevin and Nick. Episode 10 - Day 8: 1:00A.M. - 2:00A.M. As Farhad Hassan and Josef Bazhaev prepare to complete the Uranium transaction, Rob Weiss suggests that Renee Walker be blamed for the terrorists getting ahold of the weapons. Jack races to help Renee escape from CTU. Episode 9 - Day 8: 12:00A.M. - 1:00A.M. Farhad Hassan's allies turn against him and he finds himself calling CTU for help. Meanwhile, Jack comes to Renee's aid when the White House prepares to prosecute her for murder, and Cole discovers Renee's secret and confronts Kevin and his partner. Episode 8 - Day 8: 11:00P.M. - 12:00A.M. Episode 7 - Day 8: 10:00 P.M. - 11:00 P.M. Despite averting the assassination attempt on foreign peacekeeping leader Omar Hassan, Jack Bauer's day intensifies when he is forced to go further undercover to secure the unsecured enriched nuclear materials. As international delegates reconvene at the United Nations, President Taylor's goodwill comes into question and CTU races against time to assist with the mission. Episode 6 - Day 8: 9:00P.M. - 10:00P.M. Undercover Agent Renee Walker confronts her painful past when attempting to broker a deal with a ruthless, but very well-connected German arms dealer. When CTU shifts its focus from the perilous circumstances surrounding Jack and Renee, lead analyst Dana Walsh comes up with a plan to quell her situation and Chloe O'Brian puts Arlo Glass in his place. As Jack and Renee's undercover mission takes unexpected turns, the Hassan family turmoil has President Taylor reeling as the peace agreement is jeopardized. Episode 5 - Day 8: 8:00P.M. - 9:00P.M. Episode 4 - Day 8: 7:00 P.M. - 8:00 P.M. While the newly-upgraded CTU is challenged by some unexpected and complicated circumstances, Jack Bauer becomes even more involved in preventing an upcoming assassination attempt on Omar Hassan, a visiting President. Meanwhile, international security is jeopardized by an explosive event, and Jack is reunited with agent Renee Walker. Episode 3 - Day 8: 6:00 P.M. - 7:00 P.M. Episode 2 - Day 8: 5:00 P.M. - 6:00 P.M.
For the first time in New York City, Jack Bauer is reluctantly drawn into action as President Allison Taylor negotiates plans for international security with Middle Eastern leader Omar Hassan. As the 8th day keeps unfolding, we learn that CTU, now upgraded and operated by M.B.A.-schooled Brian Hastings, still has Chloe O'Brian, but also expert analyst Dana Walsh and systems analyst Arlo Glass. Episode 1 - Day 8: 4:00 P.M. - 5:00 P.M.
For the first time in New York City, Jack Bauer is reluctantly drawn into action as President Allison Taylor negotiates plans for international security with Middle Eastern leader Omar Hassan. As the 8th day unfolds, we learn that the upgraded CTU, now operated by the M.B.A.-schooled Brian Hastings, still has Chloe O'Brian, but also expert analyst Dana Walsh and systems analyst Arlo Glass. What's Ahead on '24: Legacy'? The series' showrunner talks about next season and this season's finale. Did Jack Bauer make Freddie Prinze Jr. quit show business? Better later than never. Many fans probably figured that the "24" movie had been forgotten, coming up on the two-year anniversary of the show's end. Not so. Apparently, as soon as Kiefer Sutherland is available circa April 2012, the "24" movie will start shooting. 24 is currently available to watch and stream on FOX. You can also buy, rent 24 on demand at Amazon Prime, Amazon, Hulu, Vudu, FandangoNow, Google Play, iTunes online.